Part of my role in the Open Access team is depositing theses to Spiral and providing guidance and advocacy to students. 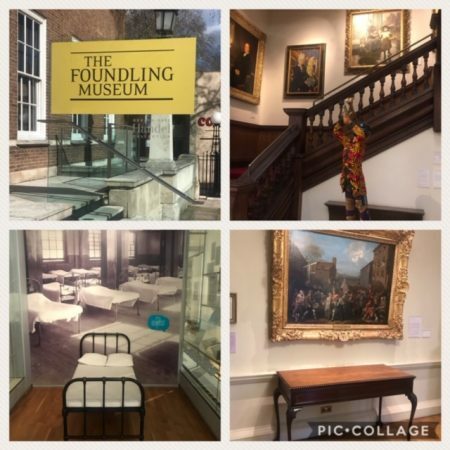 I recently attended the Copyright for Repository Administrators: Open access, Theses and GDPR event held at the Foundling Museum which focused on best practices for e-theses in open access repositories. It specifically focused around the issues of copyright and General Data Protection Regulation (GDPR) compliance; advocacy and clear guidance for students. There were some very interesting talks presented by the four speakers. I think one of the more interesting talks was by Zoe Walker-Fagg, Project Co-ordinator of Scholarly Communications at at the University of Cambridge. Her talk, entitled GDPR and repositories: making the Apollo repository compliant addressed the issue of student personal data being live on repositories. The GDPR policy came into effect in May 2018 to provide new guidelines around the handling of personal information for all EU citizens. Zoe covered four areas where Cambridge were making their repository GDPR compliant. Firstly, the issue of student signatures in both their printed and electronic theses, a GDPR breach of personal data. An issue face by many HEIs, including Imperial. This was tackled by manually covering up student signatures in their printed thesis as well as users’ signatures (from completed Thesis form attached to the thesis). A similar process was undertaken to delete signatures from electronic theses, which is on-going, along with retrospectively removing signature from older theses, in order to be GDPR compliant. The second action Cambridge took was to update permission forms /deposit licences where potentially a signature would have been required and replace it with a declaration statement. Where personal data like signatures were still required for permission forms, for example to from student for inter-library loan, these data were stored and clearly marked to be easily identifiable and kept until the appropriate length of time. Thirdly, to update their guidance for both students and researchers depositing data into their data repository, so that it falls in line with new GDPR policy. To ensure that students and researchers have clarity around making personal information openly available and in what instances personal and sensitive datasets could be deposited. Finally, to ensure GDPR compliance, Cambridge also checked that external suppliers and support systems such as Sharepoint kept personal data in secure locations. Sara Gould, from the British Library talked about EThOS which is a national aggregated record of all doctoral theses awarded by UK Higher Education institutions. It offers free access to the full text of as many theses as possible for use by all researchers to further their own research. The service now holds over 500,000 UK theses, of which 54% is open access. Sara explained that the digitisation of theses via the ‘theses on demand’ service had reduced the issues of copyright (in relation to author permissions and third party copyright). This was because increasing numbers of theses are being made open access and therefore could be harvested via EThOS, either full-text or by a link to an institutional repository. The BL also encouraged repositories to mint DOIs for their theses, and students to use their ORCiD in their thesis as these identifiers can then be harvested. Sara also touched on the issue of data protection and confirmed where possible, that the BL was removing signatures from theses when and where they found them. One caveat was the BL, understandingly, could not retrospectively remove signatures from all the copies of theses that they held. The question was raised of the difficulty of tracking down other copies (to remove signatures) on other platforms or aggregated repositories such as COnnecting REpositories (CORE) which harvests the full-text copies of theses from UK HEI repositories as well as research outputs. The BL is piloting their new open access shared repository, with partners from the Tate, British Museum, National Museum of Scotland and Museum of London Archaeology (MOLA). The shared repository will be launched later in the year and its aim is to increase the exposure and impact of cultural research. Dominic Walker, (who previously worked in the OA team at Imperial) talked about Open by default: electronic theses at LSHTM, which provided an overview of the London School of Hygiene of Tropical Medicine’s open access policy in relation to e-theses, which by default makes all their theses open access under a Creative Commons Attribution Non Commerical Non Derivative (CC-BY-NC-ND) (students do have an option to choose their own licence). At Imperial, since November 2018, students are now able choose from 6 Creative Commons licences, instead of the former default licence CC-BY-NC-ND. LSHTM decided to mint DOIs for all their theses using DataCite in recognition that theses downloads are higher than publications and they contained important research. The repository also has the Altmetric plugin to measure impact and downloads Lastly, Dominic touched upon the work LSHTM was doing on training and advocacy provided to students questions and concerns around copyright and open access of their thesis. London South Bank University’s Stephen Grace from presented on Baby See, Baby Do: modelling good scholarly communications behaviour with doctoral which looked at best practices for training, induction and advocacy. The aim was to make guidelines and regulations clear for doctoral students on the subjects of open access, copyright, licences, embargoes, research data management. Stephen encouraged institutions to make sure that students are aware about the guidelines and processes from submitting their thesis to having their thesis open access online, and the implications of open access publishing. Stephen also mentioned that institutions should consider how students can receive feedback about the impact of their thesis through Altmetric. Overall, I think the key messages were around data protection and GDPR compliance; providing clear and effective guidelines, procedures and training on open access and copyright to enable doctoral students to make right choices. 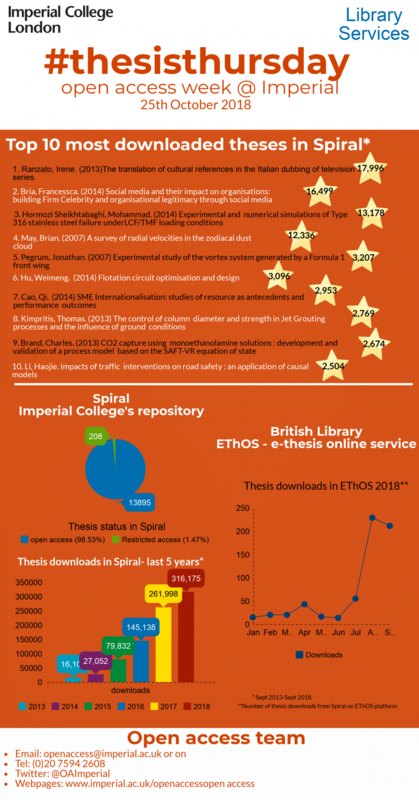 The #thesisthursday infographic was produced for Open Access Week 2018 to provide statistics of Imperial College theses collection in Spiral, the College’s repository. The infographic includes the top ten most downloaded theses in Spiral (from Sept 2013-Sept 2018) including the total number of downloads. You can view the infographic online and click on the hyperlinked theses which will take you to the Spiral record, where you will be able to download the thesis. Theses numbers and their status in Spiral – showing the percentages of open access theses and restricted access theses in Spiral. Thesis downloads in Spiral – showing the increase of downloads to Spiral over a 5 year period (from Sept 2013-Sept 2018).